"It's your own fault! You had no business bringing Indians into New Jersey!" To the modern moviegoer, California and the film industry seem inseparable. But the American motion picture didn't start there, and in fact flourished on the East coast long before Hollywood was established. This classic documentary from 1964 takes a look at the early years of American cinema and the studios that once stood where the George Washington Bridge now rests. It was natural that New Jersey be a setting for movies, since Thomas Edison held many of the key patents and his lab was located there. The first American movie studio, the Black Maria (actually a tarpaper shack with a skylight), was attached to Edison's lab. When others discovered that the hills and woods of New Jersey could plausibly substitute for the Wild West, there was no stopping the burgeoning industry, and a plethora of studios sprang up. Most of them are gone now, such as Solax, Kalem, and Champion, but there were also some familiar names at work before 1920: Fox, Paramount, Universal, and Goldwyn among them, and directors like D.W.Griffith and stars such as Mack Sennett and Mary Pickford. This 1964 documentary tends to smack of 1960s small-town boosterism at times, but for the most part it's restrained and covers a fascinating era of history quite well in its brief running time. Included in the program are three complete films, Rescued from an Eagle's Nest (1907), starring Griffith; The Curtain Pole (1909), a wacky slapstick comedy featuring Mack Sennett; and one of Pickford's earliest surviving films, The Lonely Villa (1909), both of which were directed by Griffith for Biograph. The narration appropriately points out important moments in the development of cinema underneath these films and the effective devices used by Griffith in his influential early Biograph films. For the most part the narration is respectful without being venerative, and skips the corny humor that so often infiltrated documentaries of this period. The documentary is abridged somewhat for this disc. DVD producer David Shepard indicates that much of the change to the original 54 minute running time is from deletion of excerpts of the Griffith film The New York Hat (1912), which is included in its entirety in the supplements. He adds, "The only other cuts in the documentary were to get rid of serious factual errors; for example, he had a section on Tom Mix westerns made in Fort Lee [actually, none were; all were made in the west], and a very drawn-out and purple ending. The film is otherwise as Hanlon made it, although I was able to (greatly) upgrade the quality of all the film excerpts except The Curtain Pole and remake many of his transfer-type title cards." The result is certainly well done and comprehensive within its running time, with copious illustrations from stills in addition to the three complete films. Image Transfer Review: The original full frame image is preserved here. The picture tends to be fairly grainy, and on occasion it's jumpy to boot, betraying its very low budget origins. The incorporated short films are passable, with Eagle's Nest looking pretty dupey and hard to make out. The other two films are rather better, but the supplemental material puts all of that to shame. Detail on those films is good, with decent contrast and black levels with satisfactory shadow detail. There is some nitrate decomposition in spots, as is to be expected in material of such extreme age and the grade is not reduced for that. Audio Transfer Review: The documentary's 2.0 mono sound is rather drab and murky sounding. The music in particular sounds wretched, although the narrator's voiceover generally comes across fine. Hiss and noise are well controlled. The modern music scores on the bonus films sound very good and have good presence and depth. Extras Review: A nice accumulation of films shot in New Jersey are included as bonuses, making up about three times as much running time as in the documentary itself. The first, directed by Griffith, is the classic The New York Hat (1912), which has already appeared on several other DVDs, but as noted above was included only in part in Hanlon's original documentary. Here it's provided complete. Pickford is utterly charming in this, and Lionel Barrymore makes his film lead debut as the minister who holds a secret trust fund for Mary; when he buys her an elaborate hat she admires, scandal ensues. When Charles Hill Mailes as Mary's father tears up the hat in a rage, it's hard to keep a dry eye when you see Mary's reaction. Two features directed by Maurice Tourneur make up the balance of the extras. The Wishing Ring (1914), from World Film Corp, features Chester Barnett as Giles, the ne'er-do-well son of the Earl of Bateson (Alec B. Francis). After getting expelled, Giles becomes a gardener and meets young Sally (Vivian Martin). A group of gypsies convinces Sally that a ring they've sold her will make wishes come true, and Giles sets about granting those wishes, with potentially tragic results. Although somewhat formulaic (not to mention politicially incorrect), Tourneur shows an interest in character and naturalistic acting. He also pokes fun at already-developing cinematic conventions, as seen in the humorous goofing around by the stars during the titles. The Mont Alto Orchestra's music score feels terribly monotonous and repetitive, although the listing of the music used (another bonus on the disc) indicates that a wide variety of pieces were used. An abridged version of A Girl's Folly (1917) really ties the extras into the documentary, since it prominently features a film-within-a-film being shot in New Jersey, and features Tourneur himself as a tyrannical director (Josef von Sternberg also makes an appearance). A movie idol, Kenneth Driscoll (Robert Warwick) has a shot in his new Western spoiled by ingenue Mary (Doris Kenyon) when she thinks the Indians are genuinely attacking. Driscoll of course falls in love and promotes Mary for a screen test and her eyes begin to be dazzled by the bright lights of Fort Lee. The story takes some unexpected turns despite this rather pedestrian beginning, and Kenyon's vivacity makes it a highly entertaining little entry. The score by Robert Israel feels much more appropriate and is less annoying than that for the companion Tourneur film. Producer David Shepard indicates to us that the abridgement of this feature is primarily to remove severely deteriorated nitrate film that rendered long stretches completely unwatchable. Shepard notes, "As it happened I was able to save all but a couple of shots of the material on moviemaking in Fort Lee and cut almost all of the romance, yet make something more or less free-standing with it." I'm inclined to agree; other than the short running time one hardly feels that anything is missing from the film, and certainly the moviemaking business is the heart of its reason for appearing here. The package is wrapped up by substantial liner notes from Richard Koszarski, noted film historian and member of the Fort Lee Film Commission. Chaptering on the documentary is very good, with stops to go directly to the shorts included, and the bonus films also carry decent chaptering themselves. A delightful set of extras that make this a must-buy for silent film fans. 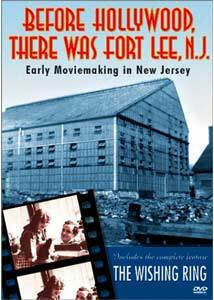 An important bit of film history is preserved here, with numerous important films shot in New Jersey to boot, making this essential for anyone interested in early film history. Though the sound on the main film isn't the best, the video transfers are generally quite good.